If you are not purchasing from one of our members and specially if you are buying from a Pet Store, please be very careful as to what you are paying for. It has come to our attention a number of times now that unregistered breeders are passing off part bred cats as Birmans. Usually these kittens have no white on their feet, which is a breed characteristic. A pet kitten may not have perfect gloves (the front feet and top of the back feet) or gauntlets (a spear head of white up the back hocks on the back feet) but they will ALWAYS have some white on their feet. Their eyes are Blue, some deeper than others but always Blue. If in doubt, speak to a registered breeder. You do get what you pay for so if they seem really cheap and are advertised in the newspaper, often they are not really pure bred Birmans or not from registered pedigrees. 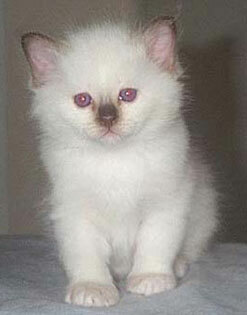 The minimum age for a Birman kitten to leave home is 10 weeks. It is at the discretion of the breeder if it is older than this as some breeders prefer their kittens to stay with mum a bit longer for some more lessons! The breeder must supply you with a health guarantee, vaccination certificate and the micro-chip form. Most breeders will also desex your kitten before leaving which means they will normally be around 12 weeks or a little older. Those that do not do this, will require you to desex your kitten by 5 months of age unless bought specifically for breeding. Kittens bought for breeding will require the registration certificate for transfering the kitten into your own name by a Governing Association. You should be given a diet sheet detailing the food your kitten is accustomed to and the brand of cat litter used so you are able to settle your new kitten into it's home with a minimum of stress. Ensure your kitten is clean, with clear eyes and clean ears. There should be no parasites and he/she should be well fed, free of signs of illness and alert. It should be reared in a clean, airy, spacious environment with plenty of human handling. 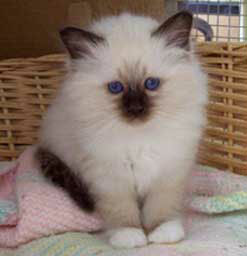 Ask the breeder to explain about grooming your Birman as well. Whereas they are easy to care for that does not mean they do not need any grooming as a weekly comb and brush is still essential. If you intend to leave your kitten alone for long hours in an empty house while you work, please give some thought to having two. They will keep each other company and sleep and play together so they are not lonely. 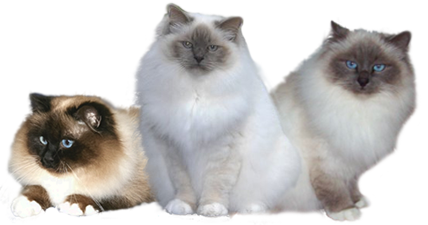 This will in no way take their attention away from you as you will have two Birmans trying to sit on your lap when you arrive home! Give them toys to chase and a tall scratching pole to climb and they will be happy. Remember, your pet will depend on you for hopefully 15 years or more and it will be your responsibility during this time to ensure good quality food and vet care is available. You will be their life line, please take your purchase seriously. Please contact the breeder if you have any questions as they will be glad to help. If you visit a Birman Cat Club member and are not happy with the conditions, please notify the club of your concern. While we have rules and regulations, it is up to the public to keep us informed of any breeder who is not doing the correct thing. The club is not responsible for any action or condition of our members premises or cats and cannot be held directly responsible for their actions. We depend on feedback to monitor any situation we should be made aware of.